If feelings are on the line, The Moodsters are on the case! The Moodsters are five lovable little detectives who use special sleuthing skills to help children solve the mysteries of feelings. With the help of The Moodsters, children learn that all feelings are okay-you just have to get to know them! The Moodsters is a first-of-its-kind brand, created to educate, entertain, and enhance the social and emotional development of children. Through engaging characters, stories and toys, The Moodsters will teach children a vocabulary for their feelings to help them understand and manage their emotions, and impart simple strategies that help kids handle the everyday challenges of growing up. The Moodsters were created by parenting and child development expert, Denise Daniels. The evidence-based curriculum, developed by renowned psychologist Dr. Marc Brackett of The Yale Center for Emotional Intelligence, provides the essential building blocks for preschool social and emotional development. The new Moodsters Talking Plush Characters represent the five Moodsters detectives, who personify the emotions that all children experience in their everyday lives: happiness (Coz), love (Lolly), fear (Quigly), anger (Razzy), and sadness (Snorf). Each plush character articulates sayings and suggestions specific to the emotions they represent, and each comes with a 32-page activity book that helps kids learn about emotions while they’re having fun. Moodsters Talking Plush and Activity Book educate, entertain, and enhance the social and emotional development of children! I'm totally in love with Moodsters Talking Plush and Activity Book! Teaching kids about their emotions isn't easy and neither is teaching them how to deal with them. I had the pleasure of testing out happiness (Coz) and totally love everything this little guy does to help kids learn how to feel happy. He even suggested doing something for others which is definitely a way to make you feel happy. It's also one of the most important thing we can do to show others we love them and to help them feel happy. My daughter loves her Moodsters Talking Plush and Activity Book and begins each day with them. Each plush character articulates sayings and suggestions specific to the emotions they represent and comes with a 32-page activity book that helps kids learn about emotions while they’re having fun. Moodsters Talking Plush and Activity Book are perfect for kids 3 and up and was completely loved by my 4 year old. 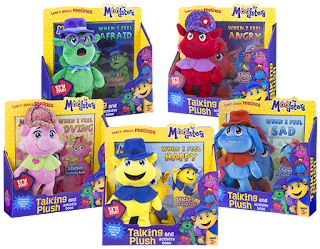 As a mom of 4 we definitely need the rest of the gang from Moodsters Talking Plush and Activity Book line to help the kiddos to work through their emotions. I would imagine even the adults could learn a thing or two from the Moodsters Talking Plush line! Purchase Moodsters at Target, ToysRus and Amazon! Click HERE to learn more about Moodsters! Follow Moodsters on social media!